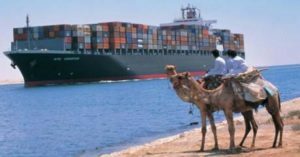 The Suez Canal Authority signed a Memorandum of Understanding (MoU) with the French company CMA CGM Group to operate the new container terminal at East Port Said Port, Chairman of the Suez Canal Authority and the Suez Canal Economic Zone (SCZone) Mohab Mamish said yesterday, informs Egypt’s State Information Service. As we wrote earlier this year, in November 2015, Suez Canal Authority (SCA) signed a memorandum of understanding with Singapore’s PSA International to conduct a study on the construction and management of a new container terminal in Port Said at the Mediterranean end of the Suez Canal. This project is part of Egypt’s ambitious plans of Suez Canal redevelopment. However, some sources later mentioned that Egypt had frozen negotiations with PSA due to disagreements over the contract and begun looking at other management companies, such as COSCO Shipping Ports. But now these rumours seem to be dismissed. According to the State Information Service, Mohab Mamish confirmed on Sunday that an agreement had been reached with Singaporean company PSA to form a committee tasked with outlining the operation and management of new container terminal. He also added that two-day meetings will be held between the representatives of the SCZone and CMA CGM on Tuesday to resume talks on managing and operating the new terminal. No details about the projected container terminal are disclosed yet. It has been mentioned only that the 1200-square meter terminal is set to be implemented in two stages. Currently, the only container terminal at East Port Said today is Suez Canal Container Terminal, whose major shareholders are APM Terminals (55%), Cosco (20%) and the Suez Canal Authority (10.3%). Its capacity is 5.5 mln TEUs annually.